Salesforce is one of the pioneers in cloud computing and it’s no wonder that its reach across myriad software categories has been nothing less than dominant. This is true even in CRM, where the vendor leverages its suite of sales, marketing, service, analytics and cloud storage to deliver a fully featured CRM solution, the Salesforce CRM (interchangeably called Salesforce Cloud). 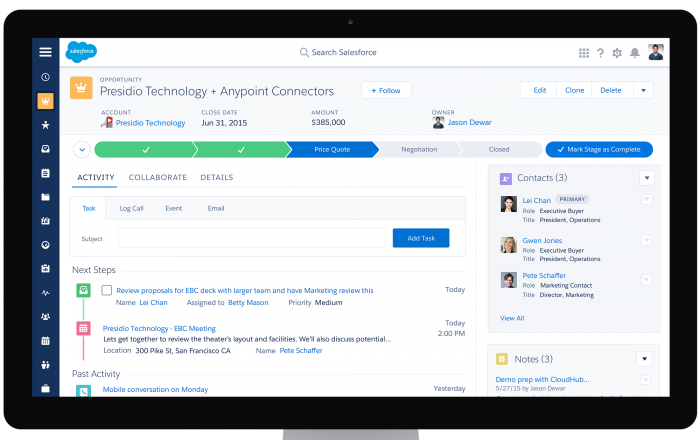 Whether used within the Salesforce ecosystem or as a stand-alone solution, this CRM packs in powerful features that help you consolidate and process customer data to surface leads. Its main modules for automation, reporting and integration give you a seamless, unified platform to nurture leads towards conversion. It’s even scalable with four price points starting at $5 per user/month and a bundle plan with other Salesforce apps. For many companies, Salesforce is the perfect CRM solution: robust, flexible, complex and the brand is trusted. But there are a slew of other solutions that offer the same or different value propositions, which may be a better option depending on your scenario. To help you gauge if Salesforce CRM is a fit for you, we compared it with other top solutions in the category. We’ll focus on the essential CRM functions and pricing to give you an idea how things stand among the best CRM solutions on the market today. But first, let’s lay down what Salesforce CRM brings to the table. Zoho CRM is a close competitor of Salesforce in both core CRM features and integration. Zoho CRM also features robust lead, contact management and sales pipeline, plus it leverages the vendor’s strength on purchase control. Zoho, after all, is notable for its invoicing and billing app. Likewise, Zoho CRM can match Salesforce CRM’s integration capability. The former also features a wide range of native integration within its ecosystem. The Zoho suite boasts of around forty apps across sales, marketing, productivity and business processes and the vendor keeps adding more. Like Salesforce, Zoho can nearly cover all your main business processes without the need for other systems. Both Salesforce CRM and Zoho CRM are scalable to the needs of small business and large enterprise. One notable difference of Salesforce vs. Zoho is the latter offers web forms. You can create coding-free forms and embed them on your site to capture leads. This is similar to HubSpot’s web forms, a useful element on landing pages for campaigns. As for pricing, Zoho CRM includes mass email in its basic plan, which costs $12 per user/month. The same feature is available in Salesforce Professional plan at $65 per user/month. In short, if email marketing is a priority to you, Zoho CRM has the better price point. HubSpot CRM is one of the most robust free CRM apps and it flaunts this advantage over the competition. For small businesses with straightforward inbound marketing needs–you send out campaign, get leads, sort prospects and drive them down the funnel–HubSpot’s offer is a bargain. Even if you have more sophisticated inbound campaigns, integrating the free software with HubSpot’s paid Sales and Marketing solutions is still a dollar cheaper or so than most fully featured CRM, Salesforce included. In short, its advantage over Salesforce CRM is obvious if you’re looking at pricing alone. When it comes to robust features, Salesforce CRM delivers more tools, especially when integrated with its other apps or third-party apps via AppExchange. It has more sophisticated analytics, more expansive cloud storage and bigger community that you can tap to accelerate the sales cycle or process real-time insights. Of course all these come with a price. So we go back to pricing as the main battleground when comparing Salesforce vs. HubSpot. SAP CRM is bundled with core CRM features sold at a fixed rate of $23 per user/month. This includes advanced features like lead management, planning and forecasting and analytics that are otherwise only available in Salesforce CRM’s premium plans. At the outset, Salesforce has a cheaper entry price. At $5 per user/month (includes five users for contact management), its basic plan is way below SAP’s rate. But Salesforce excludes the more important CRM tools in this plan. You only get content library, customizable reports, Outlook/Gmail integration, task and event tracking, mobile and an internal chat. In fact, the better comparison with SAP is Salesforce’s Group plan priced at $25 per user/month. For two dollars more you get opportunity tracking, lead scoring, routing and assignment and email templates and tracking. If you have a small team but require complete CRM functions, SAP gives you the more cost-effective plan. But if you have a smaller CRM need despite having a bigger team–discounting lead management and forecasting, for example–Salesforce CRM’s basic plan is a good fit. In essence, none is better than the other when comparing Salesforce vs SAP; both deliver value-for-money based on your priority. The stark difference on Salesforce vs Microsoft Dynamics comparison is that the latter has an on-premise option. In fact, Microsoft Dynamics CRM also has a hybrid plan, which incorporates on-premise (offline) features in its cloud version. So, if you’re looking for an on-premise CRM, the choice is obvious (Salesforce is 100% cloud). But if you require on-premise today and plan to migrate to cloud soon, this is where the real comparison boils down to details. Needless to say, Microsoft Dynamics CRM is built on the strength of the tech giant’s infrastructure. The software has native integration advantage with some of the world’s most popular business solutions including MS Office, SQL and MS SharePoint. However, Salesforce is its own dominant player in cloud computing. Something to ponder, too, Microsoft is playing catch to the cloud pioneer when it comes to cloud services. But the gap has since closed in. Like Salesforce CRM, Microsoft Dynamics CRM features multiple dashboards, integrated marketing and automation tools and a wide integration with third-party apps. Pricing comparison is also a tricky road to traverse between the solutions. They are structured vastly differently. Microsoft Dynamics offers four license levels for on-premise, from $15 to $200. The vendor requires at least five licenses to get you started. Its most popular plan is the Professional License at $65 because it allows users to write to the cloud-based Opportunities module. For cloud solutions, the Microsoft software starts at $15 per user/month, which gives you access to custom apps built on the CRM’s xRM framework. Its premium cloud license is at $200 per user/month, which gives you advanced marketing and service functions, such as, Microsoft Dynamics Marketing and the Unified Service Desk. In essence, Microsoft Dynamics CRM is costlier but that’s because it’s designed for enterprise. Even so, Salesforce CRM, at a more manageable price points, can also address large enterprise requirements. Like Microsoft Dynamics CRM, Oracle CRM offers an on-premise option on top of its cloud solution. Again, if you’re looking for locally installed CRM, Oracle CRM trumps Salesforce. But the best CRM features today are cloud-hosted for accessibility and scalability. On this respect, Salesforce CRM provides the better option. The one advantage of a SaaS pioneer over legacy vendors is that the former is often more open to third-party apps. Hence, the AppExchange may be the defining difference when matching Salesforce vs Oracle. The marketplace is referred to as the “business app store” with around 3,000 apps boasting of 2.8 million installs. It isn’t to say that Oracle CRM’s cloud solution is far behind. Its features are world-class, which include: lead qualification and categorization; opportunity tracking and management; forecasting optimization; and powerful analytics and reporting. The CRM also features integrated marketing campaign management and ROI measurement features. Infusionsoft is designed for small business, so it expectedly falls short of Salesforce CRM’s robust analytics and reporting features. However, for a small business Infusionsoft is robust and may even be more than what entrepreneurs need. Like Salesforce, Infusionsoft can integrate with numerous third-party productivity apps, from cloud storage to mailers to document management. The software is categorized as a CRM, but its main focus is inbound marketing, specifically email marketing campaigns. On this specific aspect, Infusionsoft has the better setup and experience than the other solutions here, save perhaps HubSpot CRM, its close and free competitor. It offers intuitive automated sales and email marketing processes plus clear metrics to measure your campaign’s performance. Many businesses are satisfied with this simple ability to push their campaigns and get leads in return. But if you’re looking for more advanced CRM functions, Salesforce CRM may be the better option especially around reporting, dashboards and analytics. Plus the fact that you can extend its sales and marketing functionalities by integrating it with other Salesforce apps or through the AppExchange. One telling difference, too, when we match Salesforce vs Infusionsoft is in pricing. Infusionsoft’s starting plan at $199 per month, inclusive of three users, is even more expensive than Salesforce CRM’s enterprise plan. The latter features advanced inclusions, such as, workflow and approval automation, customizable dashboards and Salesforce Private AppExchange. In fact, one of the recurring comments about Infusionsoft is that it’s quite expensive for a small business app. On the surface, Salesforce vs SalesforceIQ seem a mirror of each other. Both have identical price points and set features. For instance, SalesforceIQ’s Business plan is comparable with Salesforce CRM’s Enterprise plan. Both charge at $125 per month for five users and both have the same core features, including: advanced pipeline reporting, forecasting and mass email. Likewise, both are scaled to premium features like multiple sandboxes, unlimited online training and unlimited customizations. The main difference is on how they’re packaged. SalesforceIQ is an out-of-the-box CRM designed for small business. The set features are fixed; you just pay for the plan and you get the inclusions. On the other hand, Salesforce CRM (also referred to as Salesforce Cloud) is a fully customizable platform. It is built for larger companies with specific needs. The plans give you set features, too, but you have an option to expand the functionalities with customized solutions. When it comes to comparing Salesforce CRM with other top solutions in the category, its main advantages revolve around its robust native ecosystem, cloud computing experience and, at certain degree, its intuitively bundled price points. In other cases, comparing its best features with those of the others is a matter of priority and perspective of one’s situation.